to provide solutions with the highest standards of quality and efficiency. Since 1980, we have been manufacturing pumps and dosing & odorization systems for natural and liquefied gas. With the highest technology on the market. Since 1980 we produce pumps, dosification systems, and odorization systems for natural gas and liquefied gas with the highest technology of the market. We are a team with highest human and profesional value. We are concentrated in the quality and focused with the answers according to our requirements customers. Data Sheets: It is one tool where is detailed all the requirements demanded by the customer. 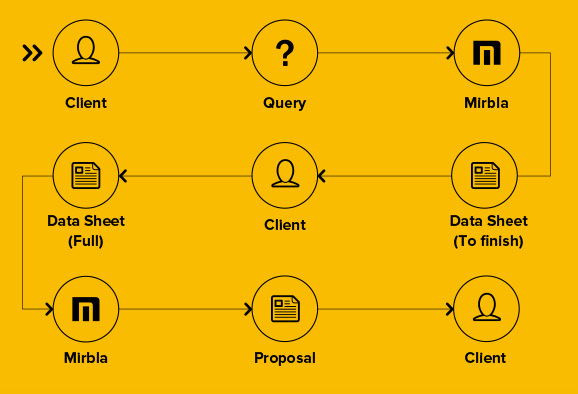 Technical Proposal: a solution for every client's request. Note: If the order requires a survey, commercial or technical personnel will be present at the site of application. Mirbla S.A. Began operations in 1980 with manufacture of small pneumatic dosing pumps and motorization systems of natural gas, proportional to the flow that responds a 4.20ma signal. In that time simply needed dosing pumps without any accessory, the idea of propose a dosing system (conjunction of one or many pumps with accessories) it was promoted, in our country by Mirbla S.A.
To strengthen this, the company was dedicated to develop accessories to give a better service and products that accompany the injection of the chemical in the final process. Was like that in every market we operate, we incorporate new products, being driven by shortage of imported products and our client’s necessities. The First Natural Gas Odorizer, that is controlled by a signal proportional to the gas flow, and it was achieved improve quality and uniformity of odor in the gas pipeline. Odorometer, instrument used to define the odorization level that has a gas pipeline netting. The continuous gas sampler, which is to extract samples in continuous way, for its later analysis and to determine its calorific power. IQ series piston diver pumps, dosing till 300 liters per hour. Until this moment we count with 2 models, reaching to 9 liters per hour. The first controls systems with bomb alarm, which change the pump by a process control signal. The development of pumps with sanitarium concept to be used in milk industry and agroalimentary enterprises. In the '90s, we took representation of Dosatron from France and OBL from Italy for its electric dosing pumps. We develop the continuous oil sampler (OS). We introduce a new pump line that meet API 675 standards. We develop the first control system for a metering pump which allows the user get operating reports from distance. In the 2000s, we managed to penetrate in the Brazilian market with our last generation odorization systems, competing with first world-class companies and keep growing up in regional markets like Bolivia, Chile, Colombia, Peru y Venezuela.